Elimination Diet | I Can Run, So I Will! I am often asked about the Elimination Diet, how to start, and how it works. Here I will explain the basic steps I took. I will go into more detail of certain specifics in later posts. First you should know, this will test and challenge you in every possible way, physically as well as mentally. Your body might go though withdraw much like a drug addict would go though. Many chemical additives are added to processed foods to make foods have a long shelf life, which is at the cost of the consumer who eats it. Some even claim that these man-made additives are also addictive. And though I cannot say for sure that is true, what I felt when I did the elimination diet sounded and felt just like a withdraw. Things were really difficult for three months, then it got easier from there, so much to the point where you dont want or crave those foods at all. The elimination diet is mostly done with all whole foods. Selecting a product with many ingredients will make it difficult to know what is causing issues. So, in the beginning at least, stick with whole foods made from scratch. A little heads up- you will spend more money on food, and yes, it’s worth it and I am willing to bet you will save more on medical bills if you don’t! Tip: look into CSAs (community supported agriculture) and local farmers markets, check out different grocers/store locations to see what they have to offer. This is a long process, but a thorough process to correctly identify foods that could be causing aliments. Be committed for the long haul! KEEP A JOURNAL! Write down what you eat right as you eat it. Believe me, you will forget! Lastly, read up! The internet is a plethora of support and information. Google Search allergen free recipes, ingredient replacements, and companies that support your exclusions. Step 1- Contact your doctor and make sure you are healthy enough to start this diet. In the beginning it can be very difficult for the body as it is detoxing from not only allergens but additives that are put in most foods sold today from the grocer. You might also want to contact a nutritionist and also follow up with blood work to make sure you are getting enough nutrients and also to document progress. This diet is not for just anyone.Those who are diabetic for example would need to take extra precaution and track glucose levels most often. Disclaimer: I am not a doctor. I am sharing my experiences and rules I went by. Please be safe. Step 2- Major Detox part 1. Even before you start the diet you might want to take a look at shampoo, conditioner, soap, laundry soap, deodorant, perfumes, toothpaste, cleaning products lotions and makeup. Ever been asked what the largest organ in the body is? It is your skin. Anything that touches your skin is absorbed and goes DIRECTLY into your bloodstream. Many ingredients in these common house hold items are allergens and harmful chemicals. For instance, most commercial deodorant contains aluminum that clogs your pores so you don’t sweat, also it has been found to cause cancer. Perfume/air freshers contain formaldehyde- yes, another carcinogen. Shampoos and soaps contain gluten and wheat products and also phthalates. Check HERE To see what household items I have fell in love with (most homemade and way cheaper then store bought!). There are many alternative and better options out there then the most use commercial brands. Step 3– Major Detox part 2- Food- For the first two weeks you will be eating three or four top allergen-free foods ONLY. Eggs – More commonly the whites are the culprit for reaction, but yolks can also be reactive. I chose Chicken, Yams and Quinoa. Yes, I ate this for breakfast, lunch and dinner for two whole weeks. No spice, nothing but. 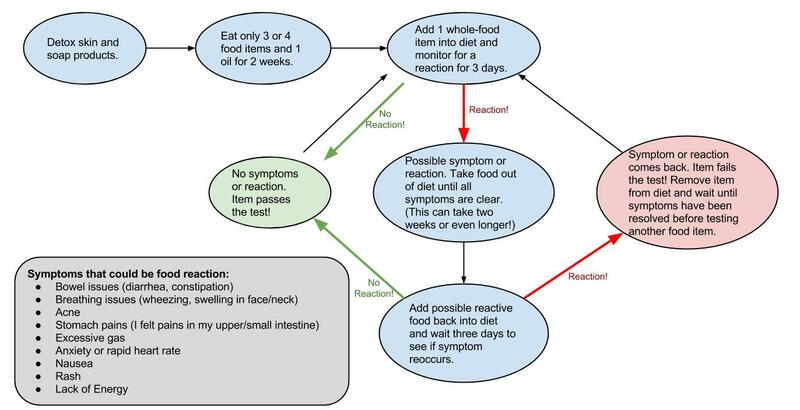 Step 4- After two weeks, you add ONE whole food item into the diet then wait three days for a reaction. Step 5- Pass or Fail. If there is no reaction, then the item has ‘passed’ the test. Congrats! You get to add another food to test for the next three days! Step 6- Keep your sanity! Yes the first three months are the worst. To me it felt just like a with drawl, I had super strong cravings, even bouts of crying that lasted up to 20 minutes, I wanted to give up so bad! But just like a with drawl, all this went away at about three months and got better from there. Try to focus on what you CAN eat and be creative with it! I ended up creating what I called a ‘Sanity Cheat’ (top allergen-free foods) to help me cope with the difficulty of the diet. Which I will post about soon. Step 7- ENJOY LIFE! This diet has changed my life drastically for the better. I no longer have heart issues (sinus tachycardia) , symptoms of MS are gone, no more high cholesterol, anxiety/depression, diarrhea, nausea, constipation, stomach pains, sinus infections ( I would get a minimum of two infections a year, and up to about six! ), my weight has be STEADY for over a year now. And I gained so much more- I don’t need medications for anything, I can taste more, smell better, and best of all- I CAN RUN!